Crua Gourmet Cuisine and Lifefood present their colorful cabbage salad with sea lettuce. For your marinade mix soy sauce, agave syrup, lemon juice, chili oil and smooth ground ginger. You can easily do it in a glass bowl. Soak the sea lettuce for 5 minutes in water and cut it into fine strips. Next you marinate the sea lettuce for 20 minutes in the soy sauce mix. In the meantime wash the cilantro and remove all leaves from the stem. 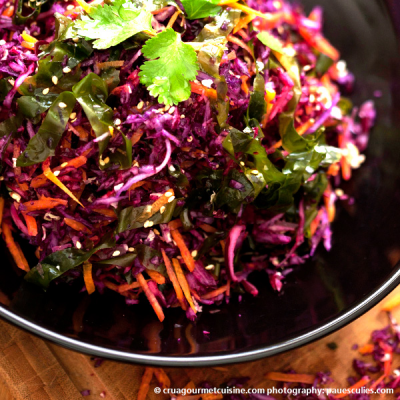 Grinds the garlic smoothly and grate the red cabbage, white cabbage and carrots into small strips. Next you mix the ingredients above with sea lettuce and sesame. Set the salad aside for about 5 minutes. Have fun decorating the salad on plates or in bowls and put some cilantro springs on top. The given amount serves 4 – 6 people.